While Ubisoft’s latest (and possibly last) installment in the Splinter Cell series, Splinter Cell: Conviction, garnered tons of much deserved attention at this year’s E3, many PS3 owners died a little inside as Xbox360 exclusivity was reaffirmed. However, new information suggests otherwise. We are all aware that when it comes to video games, the term “exclusive” has a variety of different meanings. 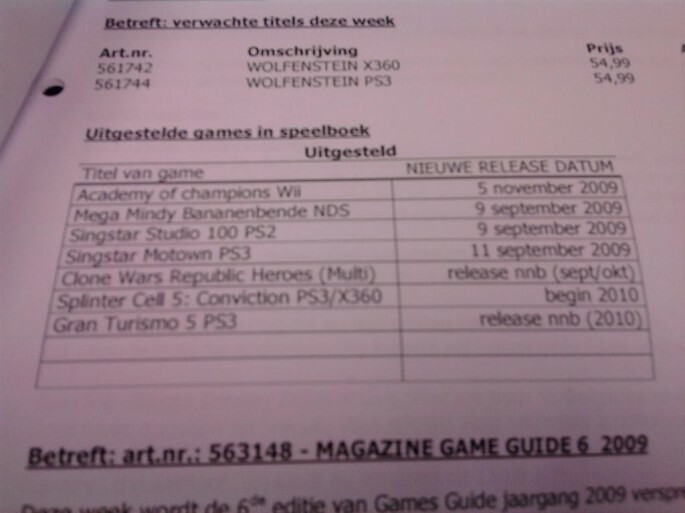 That said, this newly surfaced snapshot of a release schedule reportedly from Netherlands retailer, Intertoys, reveals what appears to be a not-so-exclusive Splinter Cell sneaking his way to the PS3. Despite that the release dates for the first four listed titles seem to be legit and GT5 is listed for 2010, there are two possibilities for what you see above. 1. This is just a misunderstanding on Intertoy’s part and whoever typed up the schedule made an error, and is now unemployed. 2. Intertoy is somehow privy to information that the rest of us little people unfortunately don’t have access to. Honestly, considering how poor of a port Splinter Cell: Double Agent was on the PS3, I wouldn’t want to play this on anything other than a 360. What do you guys think?